Intra-guild competition and its implications for one of the biggest terrestrial predators, Tyrannosaurus rex. 2011. C. Carbone, et al. Proceedings of the Royal Society B, published online in Jan. 26. Abstract: Identifying tradeoffs between hunting and scavenging in an ecological context is important for understanding predatory guilds. In the past century, the feeding strategy of one of the largest and best-known terrestrial carnivores, Tyrannosaurus rex, has been the subject of much debate: was it an active predator or an obligate scavenger? 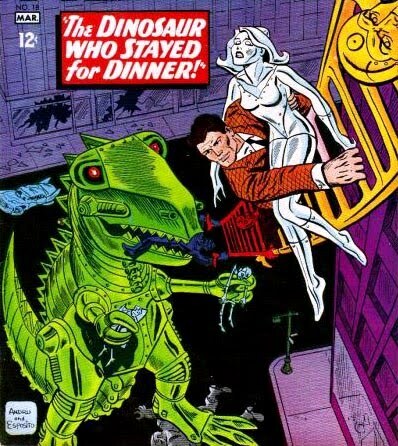 Here we look at the feasibility of an adult T. rex being an obligate scavenger in the environmental conditions of Late Cretaceous North America, given the size distributions of sympatric herbivorous dinosaurs and likely competition with more abundant small-bodied theropods. 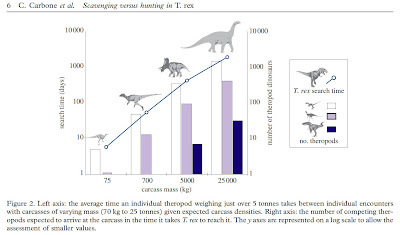 We predict that nearly 50% of herbivores would have been within a 55–85 kg range, and calculate based on expected encounter rates that carcasses from these individuals would have been quickly consumed by smaller theropods. Larger carcasses would have been very rare and heavily competed for, making them an unreliable food source. The potential carcass search rates of smaller theropods are predicted to be 14–60 times that of an adult T. rex. Our results suggest that T. rex and other extremely large carnivorous dinosaurs would have been unable to compete as obligate scavengers and would have primarily hunted large vertebrate prey, similar to many large mammalian carnivores in modern-day ecosystems.